Petty cash software Easy Pettycash : Manage your petty cash professionally! Easy Petty cash is a leading Pettycash management software that supports pettycash operations that support advances issued to petty cash receivers and also advance-less petty cash operations. • Network enabled application. Can be used by small offices to large enterprises. • Supports advances issued to employees. You can issue an advance, and match the expenses and returns/claims with the advance amount. Option to issue Advance can be removed for those companies which prohibits issuing amount in advance for an expected expense. • If a pettycash receiver has unsettled advances, software will pop-up a warning if he request another advance. • List of unsettled advances any time. Department wise, pettycash receiver wise reports. • You totally turn off 'Advances'. • Employee wise/Department wise/Expense wise/Expense group wise reports. Pie charts and line trend charts for analysis. • Define your own expense heads and groups. • Running balance is maintained by system. 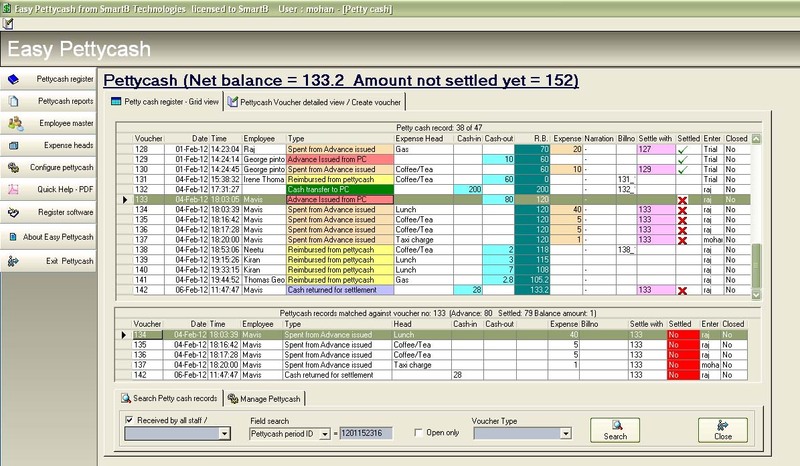 •Close petty cash period at any inerval, and bring over the balance to a new petty cash period by a single button click. • Petty cash period with un-settles advances cannot be closed before settling the entries. • Scan bills/vouchers directly from the software and attach it to petty cash entries. Supports all scanners. • Option to correct mistakes by logging in with another password. Second password can be with a higher authority. All corrected entries are reported. • Excel export of petty cash data.